Rolex has never seized to surprise us with the amount of creativity they put towards each single release. As you can imagine, we had high expectations from them at the Baselworld 2018. And true to their slogan – a crown for every achievement –Rolex GMT-Master-II 126710 watch deserves a steel crown. Even long before it was announced, enthusiastic fans waited eagerly to see what was contained in this new watch. We now have the facts, and they are exciting! For starters, Rolex’s decision to reintroduce Pepsi bezel GMT-Master in steel was rather perplexing but also one that evoked emotions in Rolex enthusiasts. 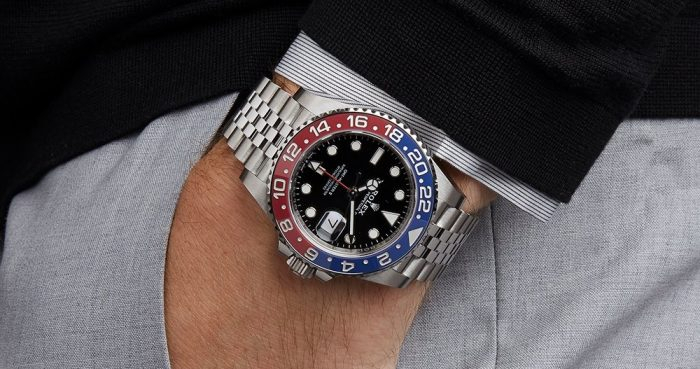 Ever since the first Rolex GMT-Master model was released, the red and blue bezel has always been the watch’s distinctive signature; although we are yet to determine who first coined the term ‘Pepsi.’ Someone might have made the connection in the 1950’s given that the soda that goes with the same name incorporates the colors red, blue and white in its logo as well. Even though the original intent for Rolex GMT-Master was to aid the navigation of airline pilots, the Rolex GMT-Master-II 126710 combination of rugged good looks and peerless functionality has attracted a wider range of travelers. Thanks to the watch’s ability to display various time zones, the robust and versatile appearance is sure to get more admirers. The Rolex GMT-Master-II 126710 almost looks like purple in comparison to the jeans blue Rolex GMT-Master 1675 of the 1970s. If you have no watch to compare against like we do, then the color is not that much of an issue because the blue of the watch just looks blue. It’s just worrying that individuals who still have their aluminum Pepsi bezel will find the color of 126710 to be quite purplish when placed side by side. Even Rolex themselves acknowledge that coming up with the right color combination was a tough nut to crack. The same difficulty can be seen in the ceramic inlay. In the case of Rolex GMT-Master-II 126710, the ceramic inlay resembles that of the white gold version. Some improvements have also been made on the case, particularly concerning lugs. 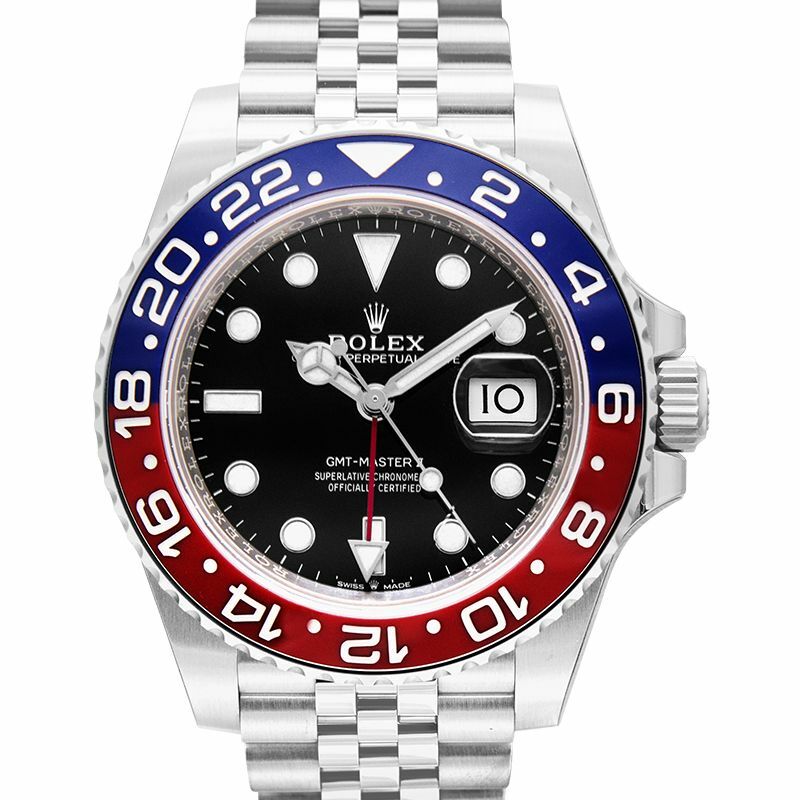 Having known that the Jubilee 69200 bracelet was made specifically for Rolex GMT-Master-II 126710, it implies that Oyster bracelet will not be a good choice for this watch. At least we will have to wait until future Oyster bracelets are released. That wait is also a nervous one as we all look forward to seeing the kind of Oyster bracelets they have in store for Pepsi Rolex GMT-Master-II 126710. The design of a watch may be the first thing noticeable, but what really matters is what the phone can actually do. That is a reality which Rolex fully understands, thanks to its decades of operation in the watches industry. In order to meet this need, the company introduced a couple of interesting features in the Rolex GMT-Master-II 126710. The new model introduces a large barrel which makes it possible to have a power reserve for as long as 70 hours. There are also Paraflex shock absorbers and Chronergy escapement. Simply put, Rolex had the idea of increasing the power reserve for at least 3 days, while at the same time operating within the -2 and +2 seconds on a daily basis. This is within acceptable chronometer specifications. A feature available in previous models, and one that has also been retained in the current version is how the watch displays time. Just like before, Rolex obliged and developed 24-hour hand which works alongside 12-hour hand. Setting the long red hand could not be done independently, but the rotating bezel which is split into 2 halve (12-hour each) helped display Greenwich Mean Time. Pilots normally track second-time zone based on GMT. As already highlighted above, the two halves of the bezel take red and blue colors. When Pepsi introduced a new generation of Rolex GMT-Master II in 2007, the company marked a sharp departure from previous references, mainly due to new and robust design with a ceramic bezel. The “Batman” nickname was coined in reference to the 116710 which took colors that looked similar to the caped crusader. Today, the Rolex GMT-Master-II 126710 continues with this trend, coming out as a more modern watch and one which is not easy to find any semblance. If you are in search of older-looking watches and wrist feel, then chances are that need won’t be satisfied by the Pepsi. The watch is designed with beauty in mind. That is not to say that it is an incredibly beautiful watch but it makes significant drift from its predecessors. Whether it’s the clasp and bracelet or the bezel and dial, this new model of watches signals that Rolex may be taking a new direction with how it engineers its watches.